Doctors offices are learning that cloud services offered by managed service providers help them save money, boost productivity, and improve their patient services. But how can you choose? How do you know if the provider you’re selecting is the right one to get the job done? Here are a few tips for finding a vendor that makes a great partnership with your medical practice. There’s no sense in partnering with a provider that’s just a one-hit wonder. Look for a service that offers medical practice management software (PMS), electronic health records (EHR), cloud storage, backup services, security services, etc. Even if you don’t necessarily need all of those services immediately, if you ever do need to expand your cloud business, you’ll want to stick with the vendor you have an established relationship with. Also, having a single vendor for all your cloud needs means you always know where your data is. Cloud service professionals don’t just wake up one day with knowledge and experience in managing the ins and outs of healthcare data. HIPAA compliance is something you have to study and stay on top of continually, and your cloud service needs to understand these regulations, too. If you partner with a managed service provider that is already used to working with healthcare data, you won’t have to worry about whether or not their products and services are HIPAA compliant. To find out more about how cloud services can help doctors offices and other small businesses, download our cloud report. 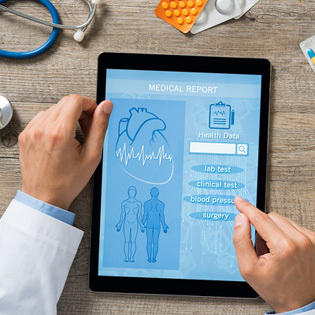 Whether your own doctors and staff need to be able to access your cloud services via your tablet computers and smartphones, or if you need to allow others access to your data and applications — such as the staff at a nearby hospital, another medical specialist, or even your patients — you’ll need to enable mobile access. That’s not as easy as it sounds. Having an IT infrastructure that is compatible with all of the various Android devices, Apple devices, Windows phones, Blackberry phones, etc. is enormously complicated. A managed service provider can enable access to all of these mobile devices and operating systems, without you having to hire your own team of developers and security specialists, for a tiny fraction of the costs. You may choose to have some or all of your IT infrastructure onsite, or you might opt to put it all in the cloud. Either way, you need reliable, affordable backup and disaster recovery services. Not only are backups and DR essential for staying HIPAA compliant, it’s also just good business sense. Backup and DR protects your business, your patient records, your financial records, and other sensitive and critical information from hardware failures, natural disasters, fires, floods, or whatever else life tosses at you. Ideally, you can get these backup and DR services from the same managed service provider that handles your other cloud needs. What else should you expect from a managed service provider?